At Victoria Airport (YYJ), We Find All Within Our Reach ! Victoria Airport is small quiet and calm. However, you see ... The airport handles more than 120 flights per day throughout North America and 1.5 million passengers per year. With all this traffic YYJ still maintain its uniqueness ... Quiet and Calm! The terminal is small and convenient. There are no running people from one terminal to the other. No fast moving shuttle carts beeping right behind - Move Please ..! Shuttle's coming ..! (At you) OOOOPS! YYJ is small, yet equipped with very modern amenities like free WI-Fi (wireless internet access), quality dining service, shopping, currency exchange etc. However, remember Airport is not in downtown. You are not in Victoria yet. You are landing in a town call Sidney. It is a 30 minute drive to Downtown Victoria. You may need a few tips to find out the best way to get to Victoria downtown. You can take Public Transport, a Shuttle Bus, a Taxi or Rent your Car right from the Airport. Relax ... You will be in Victoria Downtown Soon. Victoria Airport (YYJ) is a great way to start your vacation or end. This charming little Airport gives a very good impression of Vancouver Island and Victoria to its visitors. Consider your vacation start right the moment you land. You know why? .... Because there are things to see in the Airport too. Do you like history and art? There is a nice display of arts and crafts by local artists in the airport building. If you look, landscaping front of the terminal building offer unique welcome to visitors entering The Garden city – Victoria. 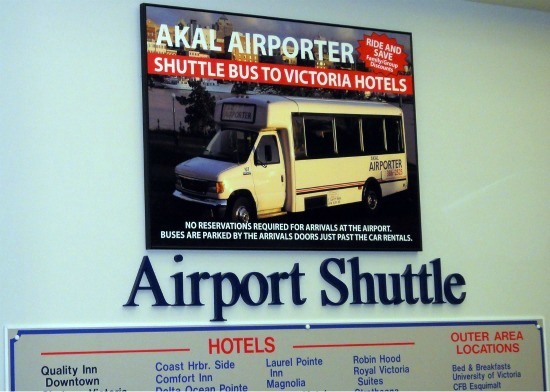 There is Akal Airporter Shuttle Bus service which takes you to almost all Downtown hotels. If you want to take a taxi, Yellow Cab of Victoria provides Victoria Airport Taxi service. No Waiting! 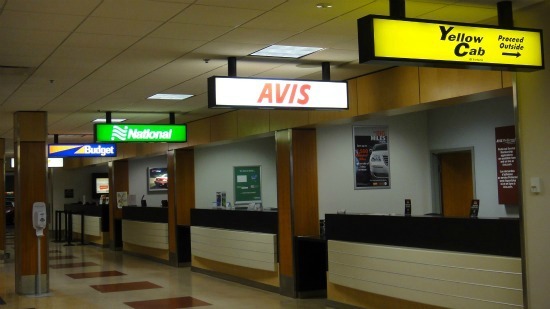 There are four Rental Car companies at the arrivals desk to rent cars. Most economical option is public transport bus, but you have to take 2 buses from the Airport to Downtown Victoria. I noticed BC Transit Guide even mention Akal Airporter as an alternative to public transit from Victoria Airport to Downtown. Public buses may have problems with large luggage. Therefore, I recommend Akal Airporter over public transport to take you to downtown. However, remember BC Transit in Victoria provides a really good service in the downtown area and we do use BC Transit bus line very often to travel in Victoria.